Unless you live under a rock, you are most likely aware of United Airlines most recent misstep. A passenger who had boarded a plane was involuntarily bumped, asked to leave his seat and then was forcibly removed. Refer to a CNN report on Flight #3411. The incident involving passenger Dr. David Dao has gone viral. There is public outcry and protests have begun. There are five lessons we all can learn from this customer experience gone horribly bad. 1. There is a reason behind every rule - Every company has rules for employees to follow. Was United following their protocol? According to attorney Brian Mahany, author of Saints, Sinners & Heroes, they weren't, "Passengers have far more rights than they know once they have boarded. Here are the rules: Airlines can legally collect your money, sell you a ticket and then deny you a seat if they have overbooked a flight. Frequent flyers encounter overbooked flights all the time. When an airline can't find a volunteer, it resorts to its published tariffs and rules (fine print) for overbooked flights. United's Rule 25, Denied Boarding Compensation, sets forth United's responsibilities for overbooked flights, the rule goes into great detail as to how the airline must respond if it wishes to ‘deny boarding’ on an oversold flight. Here’s the flaw in this passenger removal – he had already boarded!Nothing in the rule allows United to remove a passenger that is already on the plane." 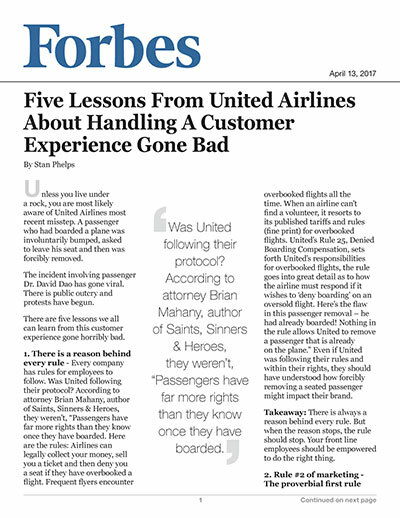 Even if United was following their rules and within their rights, they should have understood how forcibly removing a seated passenger might impact their brand. Takeaway: There is always a reason behind every rule. But when the reason stops, therefore should stop the rule. Your front line employees should be empowered to do the right thing. 2. Rule #2 of marketing - The proverbial first rule of marketing is to, "Never let the truth get in the way of a good story." United was callous on how they initially responded to the situation, apologizing on how they "re-accommodated" certain passengers. They should have be aware of the"unofficial" second rule of marketing, "When the truth catches up to you, you own it." CEO Oscar Munoz finally owned it in his third statement about the incident, "Like you, I continue to be disturbed by what happened on this flight and I deeply apologize to the customer forcibly removed and to all the customers aboard. No one should ever be mistreated this way. I want you to know that we take full responsibility and we will work to make it right. It's never too late to do the right thing. I have committed to our customers and our employees that we are going to fix what's broken so this never happens again." Takeaway: It may never be too late to do the right thing, but waiting to do so can hurt your brand. 3. Your partners are an extension of your brand - The United flight in question was operated by regional partner Republic Airlines. This emphasizes how important your partners are in delivering a consistent brand experience. One brand who understands this is Starbucks. They are rigid on their expectations from their partners. When Chris Malone was CMO at ARAMARK Corporation, the company operated 75 college campus Starbucks franchised stores. In the book The Human Brand, Malone shared how Starbucks threatened to pull their franchises because of issues with customer experience. Takeaway: You are responsible for the actions of your partners and need to be vigilant about consistency. 4. Video is a game changer - Why has this incident gone viral? One word: video. If a picture is worth a thousand words, a minute of video at 24 frames per second is worth nearly 1.5 million words. Takeaway: Every one of your customers is a reporter. Be aware of the impact video has to both build and potentially destroy your brand. 5. Past mistakes will haunt you - In 2008, Dave Carroll had an awful customer experience with United Airlines. The airline refused to allow the musician to carry on his guitar. He was forced to check it and then witnessed baggage handlers throwing around his case when changing planes in Chicago. After a year of processing his claim, United denied to pay anything. Dave Carroll launched this video in response. As of today, it has over 17 million views. Here is a video of Dave talking about Flight #3411. Takeaway: Companies who fail to learn from past mistakes are destined to repeat them.